Over the past few days we have watched in frustration as the story involving the lifesaving EpiPen has unfolded. The EpiPen is a mechanical device that administers the drug Epinephrine to individuals who experience a life threating allergic reaction to an allergen, such as a peanut or a bee sting. A severe allergic reaction to an allergen can cause the body’s airway to shut down and make breathing impossible. These types of reactions can often be fatal when left untreated. The drug Epinephrine immediately counters the body’s effects to a severe allergic reaction and is truly lifesaving in these situations. The pharmaceutical company that produces the EpiPen has increased the cost for the medication to a point where it can cost in excess of $600, (it used to cost less than $100). EpiPens have a shelf life and must be replaced every two to three years regardless if they have been used or not. This works to further increases its long term expense. This is so frustrating, knowing that Epinephrine costs only a few dollars to produce. The exorbitant cost of this lifesaving medication exceeds the financial means for many in our community who count on it when their life is on the line. There is no question that the EpiPen’s lack of affordability will cause people in our community to go without them, which could ultimately cost them their life. Several pharmaceutical companies are in the process of creating generic versions of the EpiPen that are less expensive, but these versions of the EpiPen are still projecting to cost as much as $300. This cost will still exceed the financial means for many. 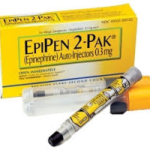 In light of the recent price developments regarding the EpiPen, we would like to let everyone know that the North Mason Regional Fire Authority’s (NMRFA) EMT’s and Paramedics have available, and can administer Epinephrine in the cases of a severe allergic reaction. Our Epinephrine is the same that is found in the EpiPens. The NMRFA is allowed to bypass the use of an EpiPen and can administer Epinephrine to patients in a very cost efficient manner. There is no cost to patients when we administer Epinephrine. Medical costs are only incurred if an allergic reaction is so severe that Epinephrine cannot counter the effects of an allergic reaction and a medical transport to the hospital is required. This can occur in very extreme circumstances. We would also like to point out that Epinephrine is carried by almost every Fire Department and ambulance company in Washington State. No matter where you are, if you encounter a severe allergic reaction contact 911 immediately. When Epinephrine is needed for a severe reaction it has to be administered in a matter of minutes. Calling 911 as soon as a severe reaction is suspected is essential. Epinephrine is only used in severe reaction cases and is not used when only swelling, hives, redness and/or itching is present. Epinephrine is used when there is a significant drop in blood pressure or there is difficulty breathing, as the airway closes down. If there is any question on the type and severity of an allergic reaction don’t hesitate to call 911. If you have any questions regarding Epinephrine or allergic reactions don’t hesitate to contact the NMRFA. Please help us spread the word on Epinephrine and its immediate availability throughout our community.